• King: $950 per ad per 4 week period. • Kong (Ultra King): $1,250 per ad per 4 week period. • King Kong (Ultra Super King): $3,000 per ad per 4 week period. • Full Wrap: $8,500 per ad per 4 week period. • Tail: $450 per ad per 4 week period. • Queen: $450 per ad per 4 week period. • Full Back Tail:$1,250 per ad per 4 week period. 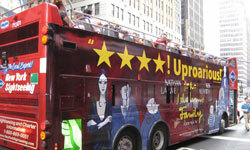 • Double Decker: R20.00$35,000 per ad per 4 week period. 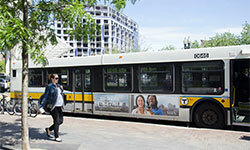 Exterion Media is the main provider of Bus advertising nationwide, giving advertisers the ability to engage with urban audiences on the move across the USA. 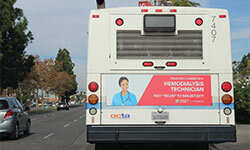 Bus gives you cover and scale, will meet your campaign objectives and can play an integral role in a multimedia plan, boosting call to action on top of other media campaigns. Our Regions, Your Audience Looking to reach a local audience? 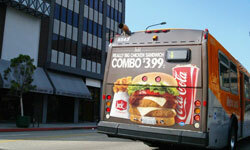 Exterion Media is an expert in providing bus advertising solutions that reach the heart of local markets. 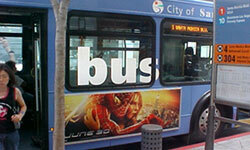 We can tailor a campaign that reaches your local audience at a national, regional or city level. 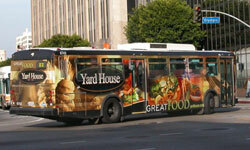 Advertise on the outside of buses to garner the most impressions possible. 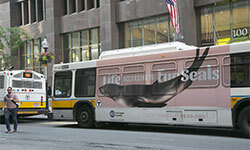 Exterior bus advertising is popular for all industries, including private companies and government and nonprofit agencies. 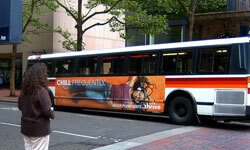 See below for the average number of times a bus ad is seen (i.e., bus advertising impressions or views) and the average bus ad size/dimensions and specifications.